You, as an educated and perceptive sports fan, know leaked reports about ongoing contract negotiations should not serve as predictors of where a player will end up or what that contract will ultimately look like. But they are good barometers of who thinks it’s a good idea to play hardball by running to the media. 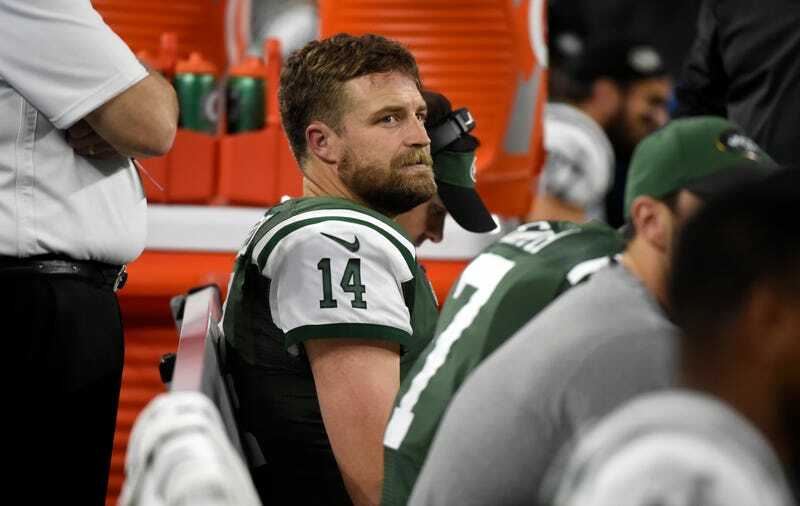 And in the case of Ryan Fitzpatrick, staring down one of the more intriguing free agent QB situations in a while, it’s starting to get a little grimy. To oversimplify things, the Jets, Broncos, and Browns desperately need quarterbacks, and Fitzpatrick, Robert Griffin III, and Colin Kaepernick (via trade) are the three most promising quarterbacks available. The teams are going to play the QBs off each other to get their best deals, while the QBs’ agents are going to play the teams off each other to get their best deals. The musical chairs math seems like it will work for everyone in the end, but it’ll be weird getting there—no one wants to get fleeced while other options are still available, and no one wants to face the desperation that’ll come when there’s just one option left. In the meantime, what is Fitzpatrick worth? (The answer is: whatever someone will pay him. But you know what I mean.) He’s been perfectly competent for the Jets, and the NFL is at a strange place with its quarterbacks where mere competence feels so rare that it comes at a premium. Just last week, in a fruitless argument with co-workers, I used the phrase “you can win a Super Bowl with Ryan Fitzpatrick.” But I recognize this is a logical continuation of a team having won a Super Bowl with Peyton Manning’s corpse, which itself is the spiritual sequel to “you can win a Super Bowl with Trent Dilfer,” which was proven wrong for the next 15 years. The Jets’ defense is good, and it’s good now, so the temptation is to go for it with Fitz and hope for the best rather than try to start from scratch at QB. The Broncos, too, could use a veteran pocket passer while most of its all-world defense is still in orange. The leverage is mostly Fitzpatrick’s; cap considerations mean both teams are going to publicly complain that he’s asking for too much, before one inevitably gives it to him.